Shopping for a Christmas dress for your little girl is a mixture of excitement and a bit of stress. Excitement spurs from the overall joy associated with the magical holiday season and the wide variety of rich, jewel-tone colors our NancyAugust.com dresses become available in. That small little bit of stress comes from the questions of whether or not your favorite Christmas dress is made in a fabric or style suitable with the winter season's chill. 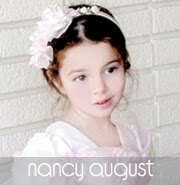 However, at NancyAugust.com, you'll find that your favorite Christmas dress for your girl is a perfect balance of beautiful and practical style! Here at our offices we've just received a large shipment of the most exquisite holiday dress. 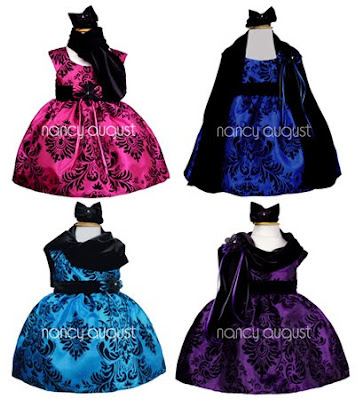 The Lovely Black Damask Print Baby Dress, Item Id: BK116B, Available in four colors! This five-piece dress is more comprehensive than the dictionary and it's made for the most sophisticated and mature little lady! A simple silhouette of a dress made of the most exquisite taffeta fabric features a classic sleeveless bodice and a full skirt supported by crinoline. The real attention grabber here is the decadent color and the intricate, velvet damask print! The entire body of this dress is decorated with a damask print reminiscent of the most beautiful vintage Victorian wallpaper! Included with this dress is a detachable rosette with flowing ribbons, a velvet bow and detachable rosette headband, velvet bloomers, and a velvet shawl! The shawl can be worn so many different ways and the rosettes can be placed on the waist, to pin the shawl, or even pinned at the shoulder! This five piece dress set, which can be customized and personalized in so many different ways, would make a fantastic outfit for holiday family photos. Be sure to check out our website to view our four colors available: turquoise, royal blue, fuchsia, and our limited edition purple, as well as alternative style ways for the lovely little shawl! You must act quickly, a dress this fabulous does not stay in stock for very long! Please please note that the shawl may present a choking hazard for your baby. It is extremely important that the child remain under parent supervision when it is worn. Ideally, the shawl would be perfect for photos or to keep her warm as you hold her. It's best to remove the shawl if she is to engage in any active or physical activity.